Welcome to this spacious, quality, updated two story ground floor entrance townhome at Kuilima Estates at Turtle Bay. Located on the West side, this upgraded two story ground floor unit features a relaxing bedroom with king bed on the first floor. The spacious master bedroom and bath on the second floor features a second high quality king bed, sliding glass doors, and television. A separate loft with two twin beds is also on the second floor. 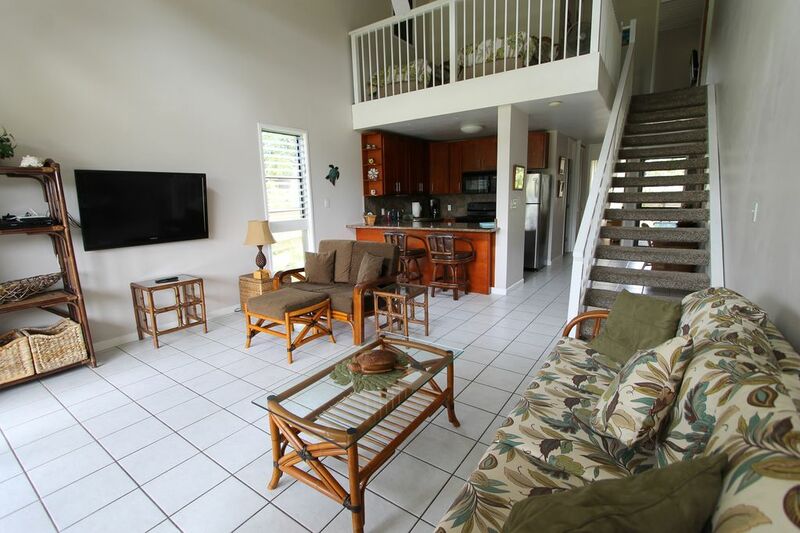 You can watch the golfers from the open lanai while you enjoy meals you have prepared in the fully stocked and newly remodeled kitchen with microwave, coffee maker, and most everything you need to cook with. The kitchen features bar style dining and there is a table and chairs on the lanai overlooking the golf the golf course. Both bedrooms have air conditioning as well as ceiling fans. High ceilings help keep the town home cool and the trade wind breezes are refreshing when the sliding glass doors are open. In addition, there is a portable A/C unit that can be set up in the living room during the hotter summer months. The living room features a new high quality sofa sleeper. There is a flat screen TV and high speed wireless internet. Within a short walk you'll find the gorgeous Turtle Bay Hotel, location for the filming of several popular films. Amazing facilities including five restaurants, horseback riding, miles of walking trails, snorkeling, surfing, scuba, helicopter tours, and of course great beaches which will provide you with endless opportunities for fun and relaxation. The hotel is not affiliated with the condo complex at Kuilima Estates however you may eat at the hotel restaurants and you are welcome to use the public beaches and walking paths to the right of the hotel. You will be happy to know that beach parking is free should you decide to drive instead of walk. Please be aware that the hotel pool is reserved for hotel guests only. However there are three very nice pools (as well as tennis courts) on the condo grounds. Golfers appreciate the Palmer Championship Course and the Fazio Course with its discounted rates after 4:00 pm. World famous surf breaks at Sunset Beach, Rocky Point, Pipeline and Waimea Bay are arrayed along North Shore's scenic coastline. Step back in time to old Hawaii and enjoy the beaches, quaint shops and unique restaurants of Haleiwa. Don't miss Matsumoto’s Shave Ice, the North Shore’s shrimp trucks, or an exciting swim among the iconic Honu, Hawaii's famous and once nearly extinct sea turtle. Our apologies for not being able to update the calendar regularly on this website. Please feel free to call or email for the most up to date availability. Please be sure to read the notes section in the pricing rates for complete pricing information. Updated bathrooms with tile and stone, sliding glass shower doors. One Assigned and guest, free. Newly remodeled kithcen with cherrywood cabinets and granite counter tops. At counter - and on patio. Folding table under bed for larger group dining. Two televisions - one in living room and one in master bedroom. Three pools to choose from. Open lanai features view of golfers and course. This lanai is no longer screened in but is open to take advanage of the view. This condo was perfect for our family. Very clean, plenty of beds, and lots of hooks to hang towels and swimming suits. We would definitely stay here again. Condo was well stocked, clean, and comfortable for our family of four. The location was ideal. We appreciated the beach chairs and plentiful towels. Washer dryer were also awesome. I would stay here again now that I know how everything works. The check in process was terrible. No instructions in condo for WiFi, pool code, etc. either. I realize I could reach out to the owner, but eventually we figured most things out. Parking at the gate and “finding” the condo is not an appropriate check in procedure as there is no where to park and we frustrated several tenants by blocking the gate. Locating the condo in the dark took 25 minutes. Just provide a gate code!!! Great location...accomodated our 7 people nicely. Very comfortable, just as advertised! Great place, great location, great Hawaiian getaway! This was a fantastic place to stay! It was clean, there were plenty of shower and beach towels, spare bed sheets, and a full kitchen with everything you need to prepare just about any kind of meal. Each room had an air conditioner which was great, although the breeze and the fans were usually all we needed. The location is perfect- just steps from the pool, and just a short walk to turtle bay. Backing on to the golf course was great for the kids as it’s never really busy so they could run around out back in between golfers going by. We were very happy with our decision to stay here and would recommend to others! Thanks again for your stay and the respect you had for Nancy's Home away from home. We work hard to keep it in good shape and it's always nice when it's appreciated. This comfortable, and spacious townhouse had everything we needed. From the kitchen utensils to linens and towels, it was no effort to just settle in and enjoy our stay, and the fabulous views from the patio. This townhouse has been well maintained and updated, and is in great condition and impeccably clean. The whole complex is well maintained as well. The location is so perfect. Turtle Bay offers restaurants nearby, and there is lots of activities available within minutes of our door. Paul, the property manager was so helpful on our arrival in the stormy afternoon. I couldn't find my checkin instructions,and he walked me through to get us safely into the unit. From there on it became a Great vacation! Thanks again, and I hope to return next year. The $400 security deposit is in addition to the rate and is refunded within 14 days of check out. One time cleaning fee of $145 in addition to rates.